This write-in Workbook is for Year 8 Middle tier students. 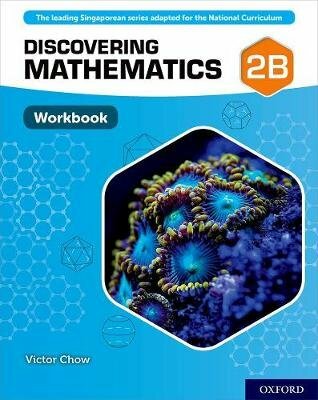 It supports Student Book 2B in the Discovering Mathematics series, with exercises split into the corresponding chapter sections. The series is adapted from the leading Singapore course to fully match the English Key Stage 3 National Curriculum. The Discovering Mathematics workbooks follow authentic mastery principles. Exercises incorporate 'intelligent practice', with careful variation of numbers to reinforce and deepen learning. Questions are differentiated into three levels: Level 1 for basic fluency practice, Level 2 for greater challenge, and Level 3 for anlaytical thinking, with additional integrated questions testing the student's ability to apply their learning. Problem-solving questions are identified throughout, and questions related to science and finance are clearly flagged to encourage students' connections of mathematical ideas across other subjects. This Workbook is designed to enable students to track their progress through a self-assessment checklist at the front. Short answers on the free accompanying website allow students to quickly identify and correct misconceptions. Fully-worked solutions containing GCSE grades are available to teachers on the accompanying Kerboodle digital resource, to facilitate support with detailed workings.